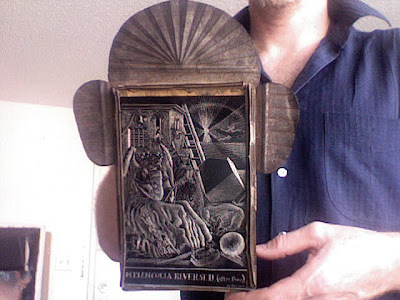 A Mexican tin nicho frame, given to me by my friend Frank X Cordero from Santa Fe. The frame had a piece of newspaper in the back of it, folded over and teared, but with a date of 1910 on it. The paper perhaps had a reproduction of a saint on it, possibly La Preciosa Sangre de Cristo, or Nuestra Senora de la Luz. I started a scraperboard-type work for this frame several months ago and have finally finished it. It's a reverse image of Durer's Melencolia engraving from 1514, in an attempt to reverse melancholy.